It's dawn in Arcadia and slowly, one by one, the Returned get out of bed and make their way down the street. They end up gathering in front of Twain's staring up at Rachel's apartment. Maggie is the first to notice something is wrong, when she discovers that Bellamy and Jenny are missing. At the government compound, Randy informs Angela that the Returned are not responsive. When Angela heads into the common room, she finds that all of the Returned are standing in a group, silent, looking out the window - presumably in the direction of Twain's. Fred arrives at the scene of the Arcadia Returned gathering and meets with Maggie. Inside, Rachel is awakes after a restless sleep due to contractions. Rachel heads to the window and looks at the gathering. Finally, after being unable to get the attention of the Returned, Fred fires his service weapon in the air and they all come awake. The Returned are shocked to find themselves in the middle of the street. Preacher makes his way into the bar and Jacob stops him to ask how the Returned ended up in the middle of the street. Preacher James promises that he is going to get answers. Jacob wonders if his grandmother felt the pull in the institution and tells James that Margaret was sent there after she made his aunt Barbara go away. James is shocked to hear this and Jacob confirms that Barbara was one of the Returned. Preacher then makes his way upstairs to Rachel's room, where Rachel, Maggie, Fred, and Bellamy are gathered. When Bellamy opens the door, James notices the flower at Rachel's bedside table. James is invited in and James questions what happened. Rachel explains that she was sleeping and woke up with a contraction, to see everyone standing outside the window. Rachel adds that this has never happened before. James puts on the southern charm and Rachel reveals that she Returned already pregnant. When Rachel experiences another contraction, James tells her to stay strong and leaves. Maggie tells Rachel that they should head to the clinic. Downstairs, James points out to Bellamy that the flower in Rachel's room is the same as the one they saw in the field. Bellamy asks what James thinks is going on and James simply says that they are all connected and that everyone has a role to play. Bellamy responds that they need to figure out what Rachel's role is. When next we see James, he is covered in sweat, praying at Tom's former church. James begins to see visions in a flash. He sees the flower again, locusts and Rachel in labour. Once the visions are done, he looks upwards, promising God that he will not fail him, adding that it is going to be difficult. When James collapses, the tree on his back is clearly visible. At the Langston's, Lucille and Henry watch and Jenny and Jacob playing on the porch through the window. When James arrives, Jenny is quick to rush over and embrace the Preacher. Lucille and Fred welcome James into their home, where they talk about the gathering of the Returned. James asks about Barbara's disappearance and why it happened. Henry says that in Margaret's mind, she probably thought that she was protecting Fred. James then suggests that since a son should not be estranged from his mother that he is willing to offer his services as a councilor. Henry is not at all open to this idea and declares that he is finished with Margaret, before leaving the room. James apologises for prying. At the government institution, Robin approaches Margaret and says that this morning was scary. Robin reveals that the government is doing tests on the Returned. Robin starts to break down and cry about her fear of needles. Margaret tries to comfort Robin, saying that she is sure the government wouldn't hurt them. Randy enters the room and calls out for Robin and Margaret intervenes to ask why Robin is needed. Randy demands to be allowed to do his job but Margaret tells Randy that he doesn't have to worry about her but the rest of the Returned. Margaret points out that the Returned are human beings and have rights. Randy tries to assure Margaret that this is not what this is about and Margaret turns around and asks the Returned, if she is the only one who wants to know why they are being taken away. This catches the attention of the Returned and they all mutter in support. Margaret advises Randy to find Angela and have her inform them what the tests are for. When Margaret says that they Returned have a right to know, the Returned become even more agitated. Randy turns on his heel and leaves and the room breaks out in applause. James shows up at the station to talk to Bellamy about what Jacob revealed regarding Margaret. Bellamy concedes that many people find Margaret troubling and questions how this connects to Rachel. James says that they are all connected to Rachel and if Margaret knows something, they they need to speak to her. James suggests that a small service from a fellow Returned at the facility, would probably help the fear there. Bellamy promises to reach out to his contact and James leaves, calling Bellamy a good man. Fred shows up at Henry and Lucille's, to find Henry cleaning out his wood working shop. Fred claims that he is there to return a drill he borrowed but Henry doesn't believe it for a moment because Fred has had the drill for two years. Fred concedes that he is checking up on Henry, who responds that he doesn't want to talk about what happened. Henry does however ask Fred if he is afraid of him and Fred says no. Fred grabs the drill and leaves. Margaret is brought into Angela's office. Angela questions what Margaret is trying to accomplish by stirring up a revolt and Margaret replies that she has no interest in starting a revolt. Margaret does however say that the tests and the way they are being treated is wrong. Margaret adds that she wishes to leave but Angela makes it clear that after what happened this morning, the facility is on lock down. Margaret calls the decision a mistake, declaring that the Returned have rights and cannot be kept against their will. Angela points out that the behavior of the Returned this morning was unpredictable and as such, the government has no idea what the Returned are capable of. Angela calls for Randy and orders Margaret to be taken to her room. As a parting shot, Margaret says that the Returned are restless and will not stand for this treatment. Angela simply replies, "we'll see." Bellamy gets a call from Angela, who requests that he come to the facility immediately. When Bellamy questions if this is about a trance, Angela realises that this happened in Arcadia as well. Bellamy says that he is trying to find answers. When Angela looks at the live security footage, it's clear that the Returned are still very much agitated. Angela tells Bellamy that right now, she doesn't need answers and instead needs someone to calm down the Returned. Angela adds that Margaret is fanning the flames and if they don't calm down soon, the Returned will be sedated and then placed in solitary confinement. Bellamy is quick to ask Angela not to do that and adds that he knows someone who might be able to calm them down. Bellamy find Preacher James, who is picking poisonous berries and asks him for his help with Returned in the facility. James says that the Returned never should have been locked up in the first place and asks for time to get cleaned up and gather his things. Bellamy leaves and Preacher says a prayer, thanking God for showing him the way and asking for the strength to see it through. Bellamy and James arrive at the facility and are greeted by Angela and Randy. James is holding a wooden box which he claims are filled with crackers and wine, so that the Returned may take communion. Angela orders Randy to take James to the common room and she and Bellamy head to her office. Angela questions what happened this morning and Bellamy says that they were sleeping and awoke in front of Twain's. Angela wonders if it was a form of mass hypnosis but Bellamy has no ideas. In the common room, James gets ready to do the communion, when he is approached by Margaret. Margaret tell James that she is skeptical about his role in Henry's return, given that in the past, his miracles where nothing more than "cheap stage tricks." James counters by saying that Margaret has learned a few tricks of her own - specifically the disappearance of Barbara. Margaret moves to walk away, declaring the conversation over but James grabs her arm saying that he needs to know what Margaret did and how she did it. James promises to help Margaret leave the facility if she helps him. Margaret asks why she should agree to do his bidding and James promises that Margaret's entire family and legacy will die. Angela looks at her white board and tells Bellamy that after what occurred this morning, she did some more calculations. Bellamy finds the idea of predicting how many more will return to be ridiculous but Angela is certain that predictive analysis works and that there are patterns. Angela reveals that it has been known for decades that this phenomena has occurred before but only in Arcadia. James has begun his communion ceremony to the gathered Returned. He invites the Returned to come forward and take communion but no one rises. James makes eye contact with Margaret and she stands and makes her way to him. The other Returned, who trust Margaret, and see her as a leader, quickly form a line behind her. Angela tells Bellamy that though the government had a file, it was not wildly believed and thought instead to be ghost stories. Angela reveals that when Returned had come back in the past, it was always only in handfuls, occurring a few times a century. Angela adds that mass Returns are rare and that Native American tribes have told stories of mass Returns in the past, adding that this Return is the largest of them all. Angela then reveals that there is a another large mass Return on the way but that she doesn't know what will trigger it. Angela says that mass returns have always been accompanied by a trigger - a new Returned who sets off the mass return. Bellamy thinks back to his vision of locusts. They are interrupted by a siren going off and Randy entering the room saying that Angela needs to see this. Angela, Randy and Bellamy head into the common room, to find all of the Returned dead, including preacher James, who is lying next to Barbara. Angela is enraged that Bellamy brought Preacher to the facility and he is quick to declare that he had nothing to do with this. Angela questions why James would poison all of the Returned. Bellamy calls Fred to tell him that James poisoned all of the Returned and killed them. Fred points out that this is impossible because the Returned cannot die. Bellamy agrees and adds that what really happened, is that Preacher broke the Returned out of the facility. Bellamy then tells Fred to get over to Maggie's clinic and get Rachel out of there now. Fred asks what is going on and Bellamy says that James will be coming for Rachel and that the last time he spoke to James, James talked about what Margaret did to Barbara. Fred questions if James will do the same thing to Rachel and Bellamy concedes that he doesn't know and that he doesn't know yet what James' motives are yet. Bellamy then tells Fred that Margaret is with Preacher and the rest of the Returned. Maggie is packing up things in her clinic, when Fred rushes in and says that they need to get moving. Fred explains to Rachel that she might be in danger and that one or two of the Returned might want to hurt her and the baby. Maggie and Fred lead Rachel out of the clinic. Fred pulls up at the Langston's and Maggie explains that Rachel started having contractions in the house. The women head into the house and Fred tells Henry that he has deputies patrolling the area and that Bellamy is the only one who knows that Rachel is here. Henry is incredulous at the idea that James wants to harm Rachel and points out that James was here in the house this morning. Fred tells Henry that Bellamy is sure and he is determined that nothing is going to happen to Rachel. Fred then reveals that all of the Returned escaped, including their mother, but Henry is sure that his mother will not show up at the house. The Returned awake and find themselves in a field. Preacher confronts Margaret about how she makes the Returned disappear. Margaret asks why she should reveal her secret and Preacher reveals that they are all in danger and that Rachel's child is a dark soul. James quotes Revelations to Margaret and declares Rachel's baby the Antichrist. Margaret calls James insane and starts to leave but James asks if the Returned are meant to be here and questions if they are angels or demons. Margaret replies that the Returned are no worse than anyone else, so James questions what happens when they all come under the control of Rachel's baby. Margaret declares that she won't do Preacher's bidding or anyone else's, before storming out of the woods. Preacher tells the Returned not to worry because he is sure that Margaret will be back. Angela is in her office working on her predictive analysis. Angela sits back and dots begin to appear furiously across her computer screen. Before long, they begin to appear all over the world. Angela realises that this means that there will be millions of Returned. Bellamy arrives at the Langstons and Fred says that the house is secure. Bellamy heads upstairs to check on Rachel and Maggie. Bellamy tells Rachel that she is going to be okay and that no one knows she is there. Rachel points out that this didn't stop everyone from showing up at Twain's this morning. Bellamy again declares that he is not going to let anything happen to her. Jacob heads outside and grabs his head. Margaret calls to Jacob from the bushes and he rushes into her arms. Margaret tells Jacob that she cannot enter the house and only wanted to see him, before questioning why there is a police car in the driveway. Jacob explains that Rachel is inside and closes his eyes in pain. A concerned Margaret asks what is going on and Jacob explains that he can feel the baby and that it's hurting him. From the house, Lucille calls out for Jacob and he rushes away, even as Margaret begs him to stay. In the house, Rachel is feeling contractions and Maggie assures her that this is a good thing. Rachel says that ever since she returned, someone has been after her and that she didn't do anything to start it. Rachel questions what kind of world her son will grow up in not knowing his father. James is preaching to the Returned at the church, when Bellamy walks in and accuses James of using him and being a liar. James explains that in the end, Bellamy will understand the reason for all of this. Bellamy tells James that he is going to have to come with him but the Returned stand and face Bellamy, as James insists that he cannot because he has other plans. Bellamy asks if the plan is to kill again and James points out that he set all of the Returned free. Maggie heads downstairs and talks to Lucille about how the labour is progressing. Lucille points out that Rachel is a doctor and that she has given birth before. Bellamy starts to appeal to the Returned about what Preacher's true agenda might be. Preacher points out that the unborn child controlled all of the Returned and asks Bellamy to consider whether or not Rachel's baby is a child of God. James makes it clear that he has a mission and will not let Bellamy or anyone else stop it. When Bellamy asks what mission, Preacher reveals that he is tasked with stopping the end of the world. Margaret arrives and announces that she knows where Rachel is. At the Langston's, the sun has set and Fred and Henry sit on the front porch. Fred gets a text, which he believes is from Bellamy, saying that he is at the church and that James is still not there. The men talk about their father sitting on the porch and how their father was seeking peace and quiet. Henry says that it's getting cold and asks Fred to come inside for a coffee break. Margaret looks at the house from a distance. 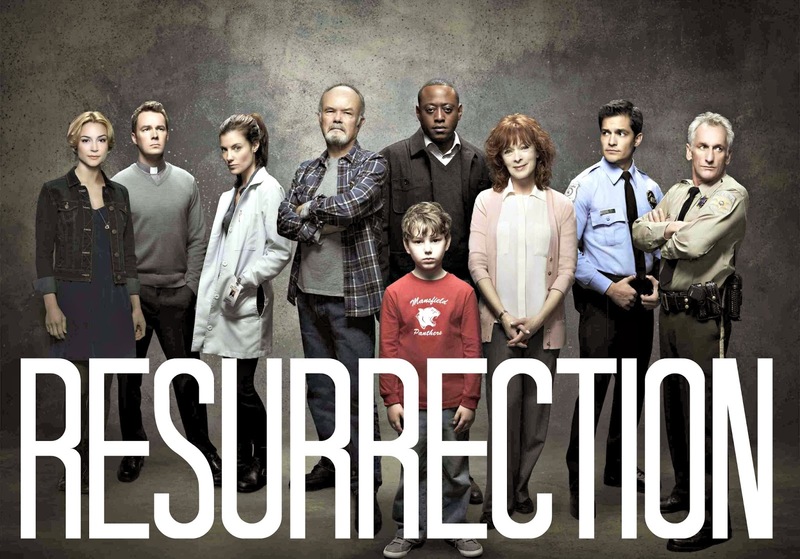 As I said in last week's recap, Resurrection has suddenly turned religious. Preacher has openly convinced the other Returned that Rachel's baby is the Antichrist and that he is on a mission from God. Really Resurrection? Is this really the best that you can do? To say that I have lost interest in this series is an understatement. Obviously, next week we will have the big arrival along with the Returned probably going berserk trying to get to the baby and Rachel. The problem is, that is not what I am interested in. I want to know why the Returned are coming back and if they have a motive. Teasing me with the idea that there are more Returned coming, doesn't even begin to address that. Further, at this point, I am sure that even if millions of Returned arrive, Resurrection is still going to give use weekly Langston drama, which is not the show I signed up to watch. Seriously, does anyone care if the world is going to experience a mass Returned? Unfortunately, I don't really have much to say about this week's episode and think that it will kind of be a blessing when this show is over for the season. My only real worry is that it will end on a cliffhanger and given the ratings, this means as viewers, we have no real shot of finding out answers the questions which Resurrection raised. I will also be sorry to Omar Epps off the air again. He is a great actor and one of the few protagonists of colour on television.